The duke invites you to his palace in beautiful Venice. 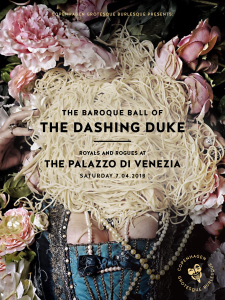 He and the Duchess are holding a baroque ball, with stunning costumes and endless intrigue. Royals romance rogues, and unique and extraordinary circumstances present themselves around each turn of the palace’s halls. Within the palace walls, gold and silver drip from the ceilings, and skirts are ruffled as strangers pass. Who is beneath the mask? Extravagant hats are paired with exquisite ball gowns, silk waistcoats, and patterned trousers. Jesters display a rainbow of colours as they trick or treat the guests, and courtesans flirtatiously greet the most esteemed, or the most adventurous in the crowd. You simply can’t guess what you’ll see next, a performance by a daring burlesque diva? A feat of acrobatics by the royal contortionists? A concert, so beautiful, it brings tears to your eyes? You’ll have to join us to find out. See you on the 7. April, 2018. Read all about the dresscode, and our archetypes – characters we’ve created to inspire you, here!